A few days ago Mania.com reported that Rachel McAdams had been in negotiations to join the cast of Spider-Man 4. According to the story she was up for the role of Felicia Hardy, also known as The Black Cat. HeyUGuys has learned that Adams isn’t the only actress up for the role. According to our friendly neighbourhood spider-source there are a number of actresses currently being considered for the role, but this at least confirms that Hardy is going to be in the film. We were also given a rough outline of the character’s story arc. Apparently she is the daughter of the new editor of The Daily Bugle, a man who is also referred to as “˜a viper’ (more on this in a second). She falls in love with Peter Parker, and uncovers his true identity. 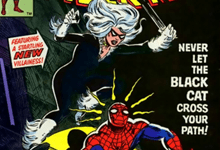 Her father then dies, and Hardy becomes a threat to Peter Parker (presumably as The Black Cat). This doesn’t fit exactly with the comic book incarnation of Hardy, who is the daughter of a cat burglar, but the character’s interaction with Peter Parker is fairly close to that in the comics. The source also implied that the word viper has some relevance. We’ve been trying to work out what, and we’re at a loss. Looking through the pantheon of marvel characters the only ones known as “˜The Viper’ are villains in Captain America stories, so it’s unlikely that it’s the name of a baddie, although our source did suggest that Felicia’s father is a villain as well as the editor of The Daily Bugle. We’re hoping to get some more details soon. We’ll let you know as soon as we do.